The CSU is the largest system of four-year public higher education in the United States. The CSU is the largest system of four-year public higher education in the United States. With 23 campuses statewide, it provides a variety of choices for transfer students. The CSU has historically played a critical role in preparing students to enter the job market. Offering degrees in business, engineering, health, education, nursing, and public administration, the CSU offers more than 60 percent of all degrees in these fields. Nearly half of all bachelor’s degrees are awarded by the CSU. ACADEMIC CALENDAR: 16 campuses are semester system, 7 are quarter system. Application deadlines: October 1 – November 30 for Fall term entry; June 1-30 for Winter term entry; August 1-30 for Spring term entry. Not all campuses accept applications for winter/spring. Complete 60 transferable semester units with a minimum 2.0 GPA. The GPA for admission can be significantly higher because of the major, campus, and/or applicant pool. Complete coursework in the major along with your General Education (GE) requirements. To satisfy GE, you have two choices: IGETC or CSU GE-Breadth. Talk to a counselor to determine which option is the best. Apply on time. All CSU’s begin accepting applications in October for the following Fall. Some CSU’s will accept applications after the filing period. The sooner you apply, the better your chances are for admission. CAUTION: Check on www.csumentor.edu for a list of “impacted” majors. “Impacted” usually means you need to apply early, complete coursework in the major and have a strong GPA. This Certificate of Achievement is designed for students who intend to transfer to a California State University campus. Students who complete this certificate will meet all lower division general education requirements for CSU. Students must complete a minimum of 9 additional upper division general education units after transfer. Courses on this list are approved for a specific academic year. A course can be used only if it is on the list when it is taken. Every effort has been made to assure the accuracy of this list at the time of publication; however, additions or deletions sometimes occur during the year. Students are encouraged to see a GWC counselor and check the ASSIST website (www.assist.org) regularly for the most current information about approved courses. ASSIST is the official repository of course articulation for California’s public colleges and universities. To receive this certificate, a minimum of 12 residency units must be completed at GWC. Students must complete a minimum of 39 units of coursework from Areas A through E including the specific requirements listed for each Area. A grade of “C” or better is required for all courses in Area A, the mathematics course in Area B4 and at least 30 of the units completed in Areas A through E. Grades of “credit/pass” can be used if equivalent to a “C” grade. One course may not be used to satisfy more than one general education requirement. Note: Honors course credit limitation – Duplicate credit will not be awarded for both the honors and regular versions of a course. Credit will only be awarded for the first course completed with a grade of “C” or better. Note: Students who are awarded this Certificate of Achievement must also request CSU GE Breadth certification at the Admissions and Records Office when sending their final transcript to the four-year school. Note: This list was current at the time of printing. See a GWC counselor for the most up to date transfer information. 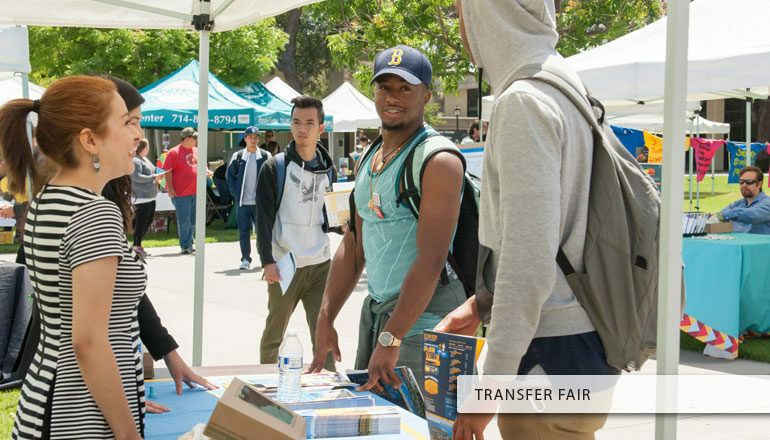 Review your academic records by meeting with a GWC counselor and visiting university representatives in the Transfer Center to determine your eligibility, competitiveness as a transfer applicant, and application filing dates for admission. Research the CSU campus and major to determine selectivity. If your major is highly selective, find out what the admissions requirements are and when they should be completed, i.e. grade point average, major prep courses and any other supplemental materials such as portfolios, interviews or letters of recommendation. Attend an Admissions and Applications Workshop. The Transfer Center offers CSU Admissions and Applications Workshops in October and November. Do not delay taking the “Golden Four” courses required for admissions: transferable math, English composition, critical thinking and communications. Some CSU campuses require these courses to be completed by the previous Fall Term if applying for Fall admission. Complete 60 transferable units with a minimum 2.0 GPA (2.40 for non-residents). The GPA could be significantly higher based on the campus and major. Complete your General Education (GE) requirements, usually by completing the CSU General Education pattern. Take courses for your major. You will be more prepared as you enter the university. See transfer information available on www.assist.org. Apply on time, apply to multiple campuses and observe all of the important application filing deadlines. Select teaching credential if you are applying to teaching majors. Enter legal name, permanent address, etc. Family Education, Income and Size Information: This information is required for all applicants interested in EOP or an admission application fee waiver. Your answers in this section will be used to help determine your eligibility for the application fee waiver and/or EOP. You are automatically exempt from this section when you indicate that you are an upper-division transfer student with 60 or more units. This should be “shaded” grey on your checklist. Add “Golden West College” and any other campus attended, including Orange Coast College, Coastline College, etc. Also, include any other institution you haven’t attended yet but plan on taking classes in the next semester before transferring. Enter dates attended including start and end dates. For Example: If you started Fall 2006 and will end Fall 2010, enter from = 08/06 and to=12/10). Eligible to re-enroll at prior institutions. If you are eligible to re-enroll, put yes for all. If you have earned college credit based on exam results for International Baccalaureate (IB), College Board Advanced Placement (AP) or College Level Examination Program (CLEP), or from military credit earned through the Air Force, Army, Coast Guard, Marines, National Guard, or the Navy, please check the appropriate box or boxes. Enter coursework and units in progress. Enter courses planned for remaining term. General Education Requirements needed for entry (Oral Communication, Written Communication, Critical Thinking, and College Mathematics). If granted, you will be notified immediately on the screen and you will not be required to submit the $55 application fee per campus. If you do not qualify, you will need to provide either a Credit Card to complete payment or mail check immediately to the address provided in the application. If you need help – you can use the online resources or save your application and come into the Transfer Center for assistance (no appointment necessary). Note: After you submit your application, please check with each individual university to which you applied to see when you need to submit transcripts. Make sure to request your final transcript with GE certification! Please contact your counselor or the Transfer Center at (714) 895-8794 or (714) 895-8348 if you have any questions or need help with the application.